This dish is one of my favorite things to prepare for myself when I want something comforting. I just love the flavor of the vegetables that are slowly roasted until meltingly tender and sweet. These vegetables are also versatile, and can be used on top of salad greens, mixed with pasta, or served as a side dish with grilled or roasted meats. My personal favorite way to eat the dish is all on it’s own when it is still slightly warm from the oven. I top the dish with some crumbled goat cheese and serve it with crusty bread as my main course. This recipe is very simple, and can easily be divided in half or doubled in size. Simply keep the quantities of each vegetable equal, and use enough oil to lightly coat the vegetables before cooking. You can either peel the eggplant or leave the peel on depending on your preference. I do not mind the skin myself so I usually leave it on. 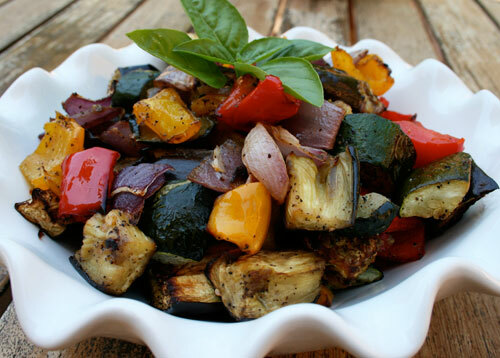 Roasting vegetables caramelizes the sugars creating a delicious flavor. Cut all of the vegetables into 1 1/2 inch pieces. Place the vegetables on a baking sheet and drizzle with the oil. Use you hands to lightly toss the vegetables to ensure they are lightly coated all over. Sprinkle the vegetables with he minced garlic, season with salt and pepper and bake for 40 to 45 minutes or until the vegetables are soft and browned. You will need to turn the vegetables over a couple of times during the cooking period to ensure even browning. Remove from the oven and cool until the vegetables are just warm. Sprinkle with the balsamic vinegar and chopped basil and toss to mix well. Serve.